Every now and then we receive calls from customers who have been presented with a situation in which they actually have to dismantle or completely remove a preexisting screen enclosure. Perhaps you purchased an older home and the existing structure has begun to decapitate, or it is not meshing well for your other visions of the home's layout and function, or maybe you are even considering disassembling and moving the lanai to a new location. Whatever the reason may be, at FLL Screen Enclosures we understand the challenges this can incur, and have excellent services in places to make the process as seamless and cost effective for you as possible. The first thing to really make sure is that this is the right decision to move forward with, sometimes a client will resort quickly to taking an old installation totally down because they have over assumed the cost of a little reinforcement, cleaning, and rescreening, in which case an old product returned to its prime can even cost less than the price to dismantle and haul away scrap. If you choose indeed to proceed with its removal, it is important to work in a way that is completely safe as well as will not harm other areas of the house. With the very possible corrosion and rust that occurred over the years this task can prove to be very dangerous if performed by one's self without professional experience. Most times specialized power tools will be needed to remove fasteners and screens, chisel away at bonds, and grind down piers and posts. 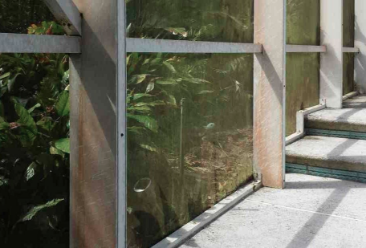 In our process we are sure to remove all furniture and other items from the area first and take great care in unbolting and lowering all components as not to inflict more damage to pool tiles, pump houses, or other areas below. It is also very important to handle the screen material carefully while it is being cut away, as the loose ends of the material can sometimes have a very sharp edge, it should never be handled without gloves or removed with anyone in the vicinity. 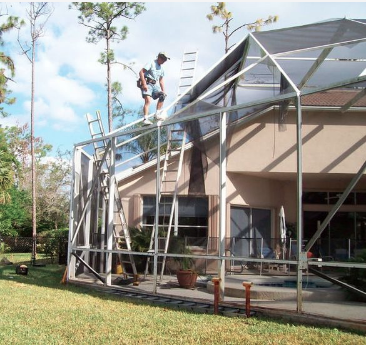 One of the most important things to assess during a tear down is the state in which the enclosure leaves your home's roof, as most attach directly to it. Things to be watchful for here is if corroded fasteners have effected the wood frame integrity or if their removal has left any part less structural. The final major consideration to make when discussing how to take down a pool screen is what you are going to do with all the left over scrap material. Thankfully in the typical construction style many of the components should be somewhat easy to discard, and if you have a fully aluminum one you may even reap the benefits of some good cash back through recycling. 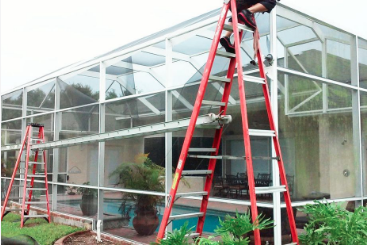 If you choose to work with us to help you handle all of these details and more for your screen enclosure removal project, we guarantee only the best of customer care and prompt service, along with an attention to detail that will leave you with spotless results. Call us today if you would like to learn more about our capabilities or hear about previous projects.